San Francisco may be a vegetarian Mecca but that doesn't the City has an aversion to meat. Just ask celebrity chef Anthony Bourdain, who says he wants to hate San Francisco but can't find it in his heart to dislike a city that serves drinkable bacon. 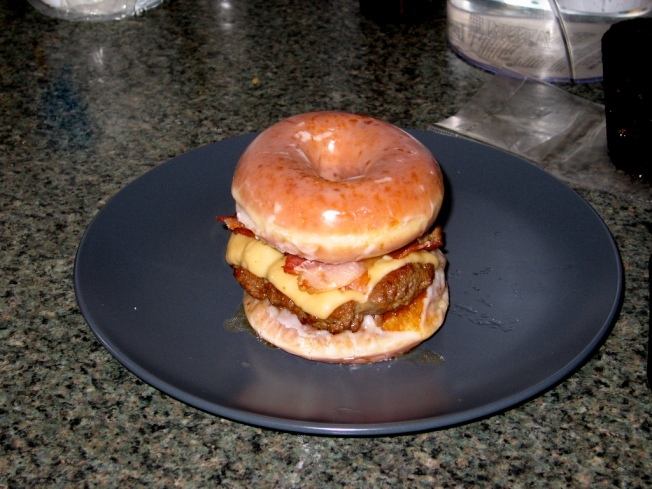 Along those lines comes the new doughnut burger. SFoodie reportsPal's Takeaway will host Dynamo Donut's Sra Spearin Wednesday making a concoction that could only come from the warped mine of celebrity chef Paula Deen. Spearin will take Dynamo Donut's cornmeal cherry-rosemary doughnut -- without the glaze -- and cut in half to make room for "artisanal ham, Cotswold cheese, and jicama slaw." The disturbing sandwich will be served inside Pal's Takeway Wednesday for $5 a piece or two for $9.